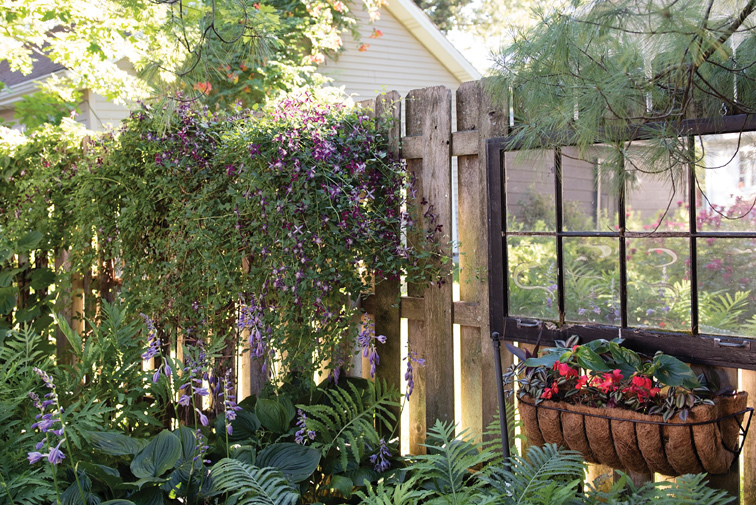 This husband and wife's longtime love of gardening has resulted in a stunning lush landscape they love to share with all. 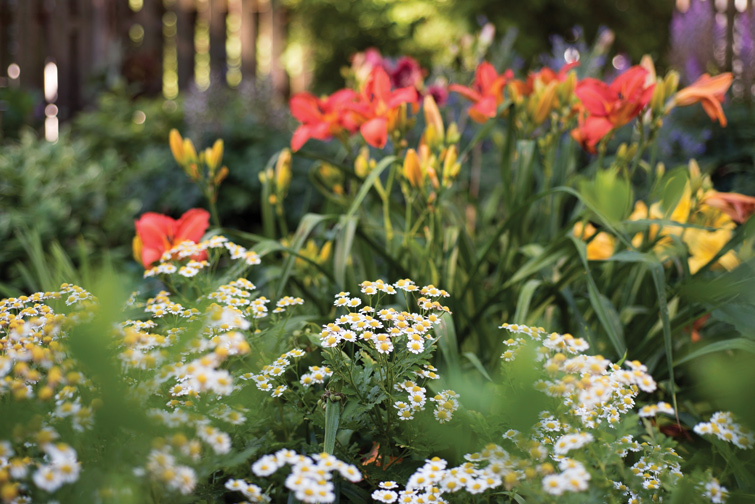 White daisy-like feverfew and daylilies. 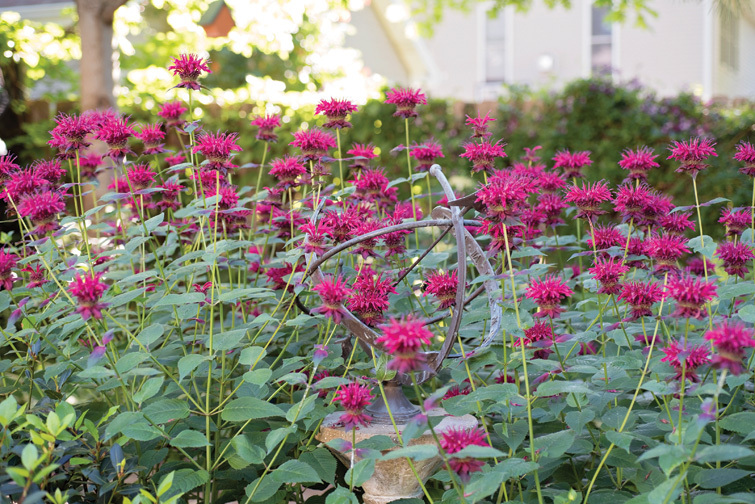 A cultivar of Monarda given to the homeowners as a gift. Carol and Dan Gravens in their garden. 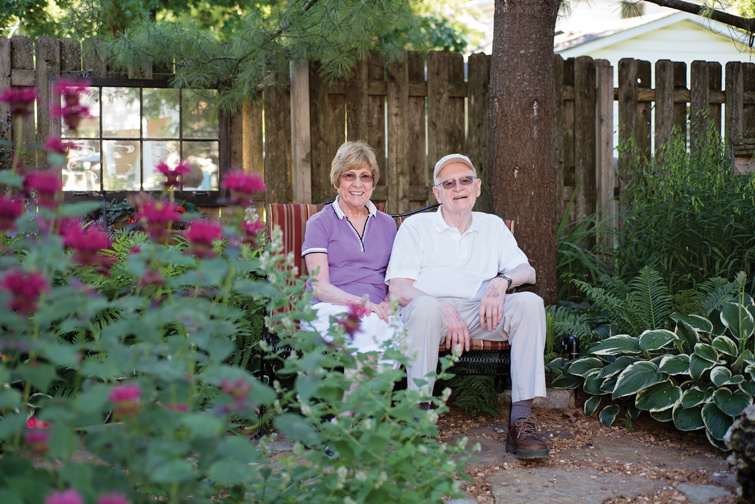 For Dan and Carol Gravens, gardening is about sharing. Married for 56 years, it is a passion they share with each other that has grown and evolved over time. They also abundantly share their gardening expertise with a variety of community organizations and willingly share the garden itself. Just ask. When they purchased their Glendale home in 1971, their focus was mainly on renovating the house and raising three children. What is now a garden that has been opened to others on every garden tour imaginable — including the prestigious Missouri Botanical Garden tour — at that time featured a grassy area for childhood games and an above-ground swimming pool. As the children grew, so did the garden with pool and play areas giving way to flowerbeds, pathways and a koi pond. Both Gravens come upon their love of gardening naturally. Carol came from gardening parents with a father that was a rosarian. Dan grew up on a farm with vegetable gardens and roses. When they began to plant on their own plot, "we realized it was mostly clay," Dan recalls. 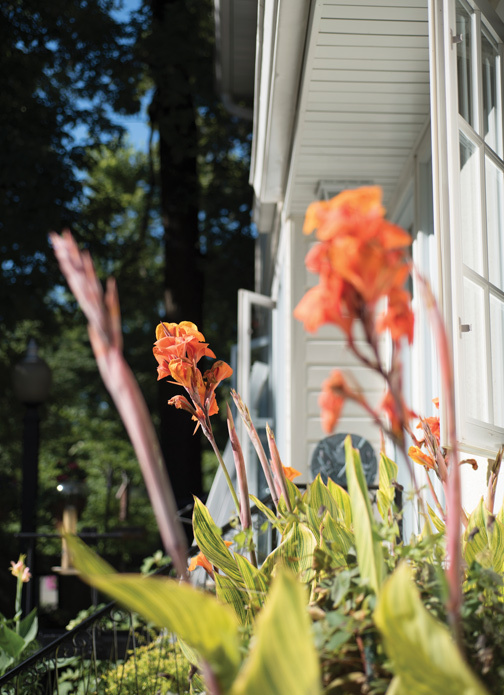 That confrontation with poor soil may have been a blessing in disguise as it caused Carol and Dan to focus foremost on the soil in the creation of their lush landscape. "We've been working the soil ever since," Dan emphasizes. "We compost everything, including vegetable scraps." 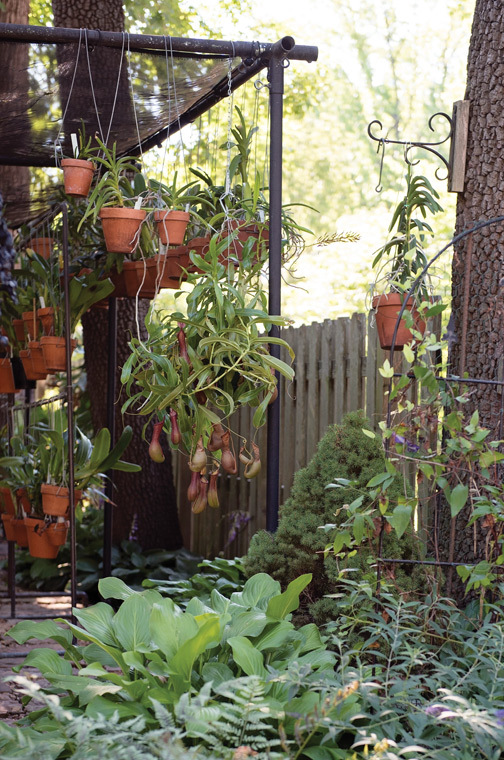 "Gardening is 90 percent soil and 10 percent plant," Carol says emphatically. As well as coming from a gardening background, both Carol and Dan have a scientific bent. Carol's career was in microbiology while Dan, a marketing manager, was also a microbiologist. When they retired from their first careers, they both went full speed into another. Carol became a Master Gardener in 2001; Dan followed by becoming a Master Gardener in 2004. Both also became Master Naturalists. In 2013, Carol went on to receive a degree in horticulture from St. Louis Community College at Meramec. Both have actively shared their talents with the community at large through the Master Gardener program, with Carol contributing approximately 8,000 volunteer hours to area gardening projects and Dan at approximately 5,000 hours. 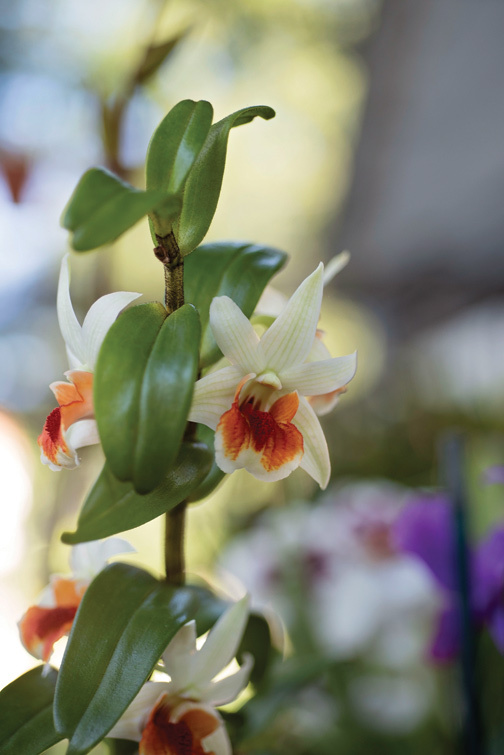 Carol's passion is orchids, and she has been invited to work alongside Missouri Botanical Garden orchid expert Babs Wagner in the three greenhouses that comprise the garden's orchid range. In addition, Carol has created 16 different talks that she shares with community groups on a variety of gardening topics, including orchids. 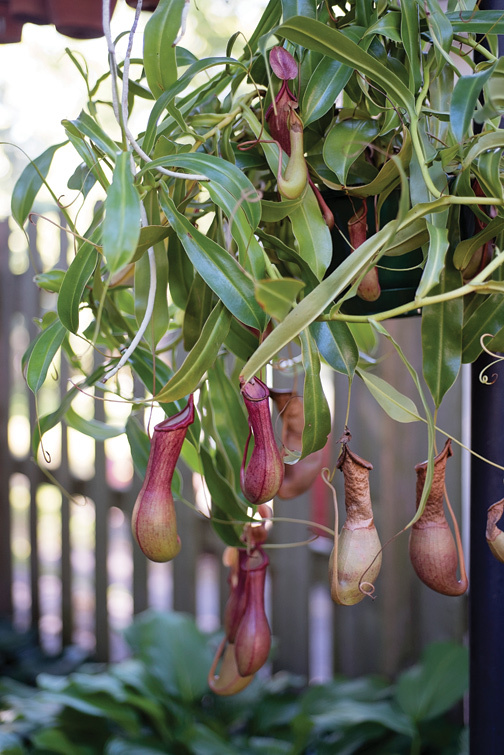 She estimates that she has 250 different orchids in her own collection. "I think you have at least 275," Dan quips, laughing. "You're always adding. Just last night you came home with five new plants." "They just fascinate me," Carol continues. "The colors are so uplifting. I can never learn enough about them. 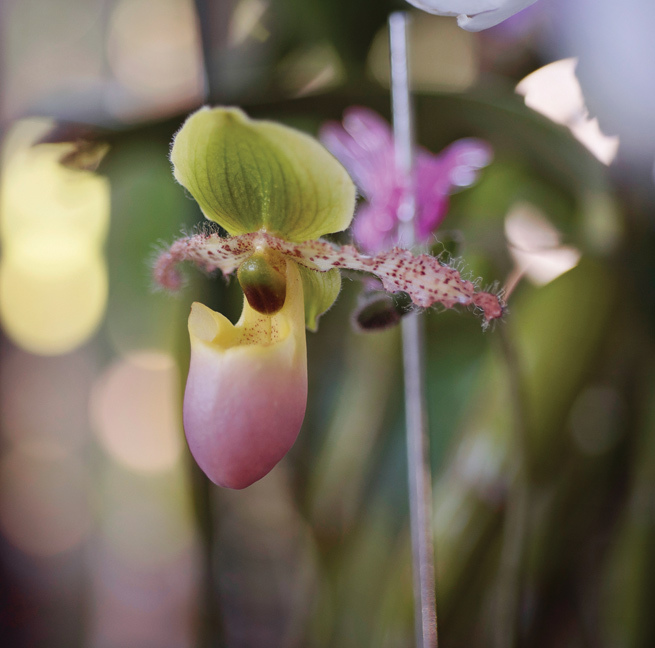 You can enjoy orchids on any level; you can belong to societies or you can go to Sam's Club and buy one for 10 bucks." Both Dan and Carol are active in plant societies including the Orchid Society of Greater St. Louis, where they served as co-presidents, and the St. Louis Water Gardening Society. Both volunteer at the Plant Doctor Desk at the Missouri Botanical Garden. 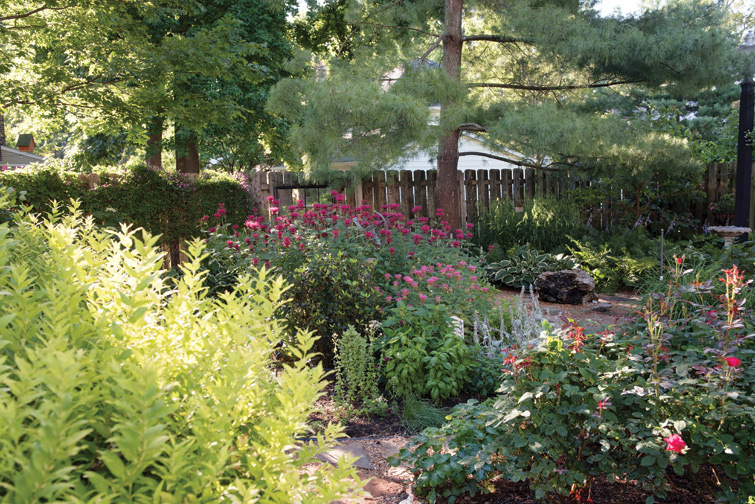 In their own nearly quarter-acre garden, their talents blend seamlessly. "I have a wheelbarrow and a shovel," says Dan. "I was in marketing, and I am the big idea guy. I will try different things; create paths so people can walk through the garden. She is more nuts and bolts as far as plants for the garden go. "She decides what we are going to plant; I am the one who carries it out," he summarizes. 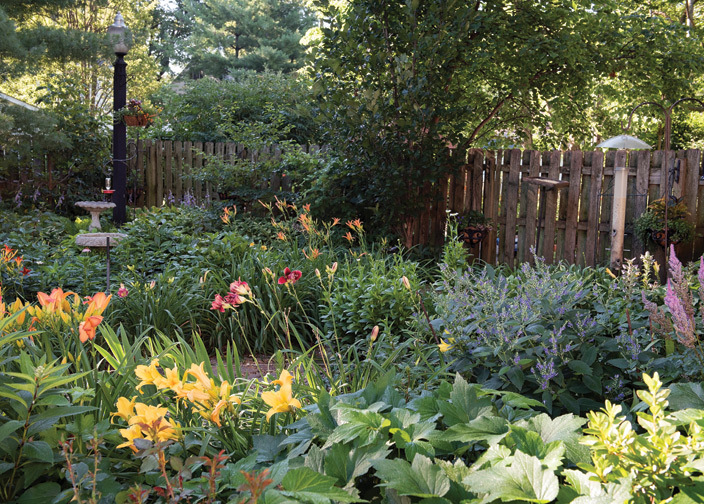 In recent years, Carol has delved more into native plants. "They are beautiful, and they require less water. They're tough because they have evolved along with the climate. Our front yard now is almost all natives, although I'm not a purist. I am trying to work on plants for pollinators. We avoid pesticides." 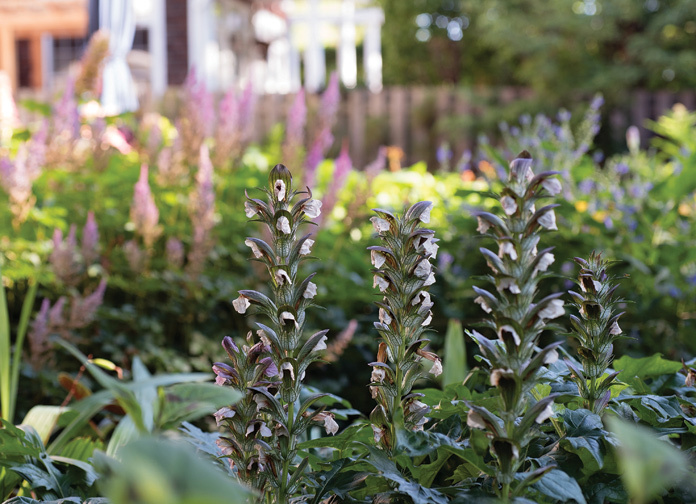 While the Gravenses' garden focuses on flowering shrubs, perennials and annuals, they share a vegetable garden with their next-door neighbor. Some of Carol's current favorite plants include clematis 'Rooguchi' and clematis 'Princess Diana.' Both climbing vines have long bloom times that last from spring through fall. 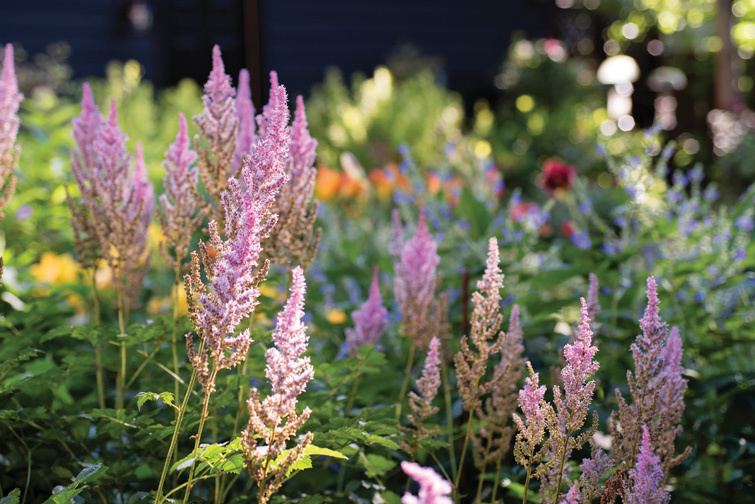 She interplants the two so the blue, bell-shaped flowers of 'Rooguchi' intertwine with the star-shaped pink blossoms of 'Princess Diana' to create a spectacular display. 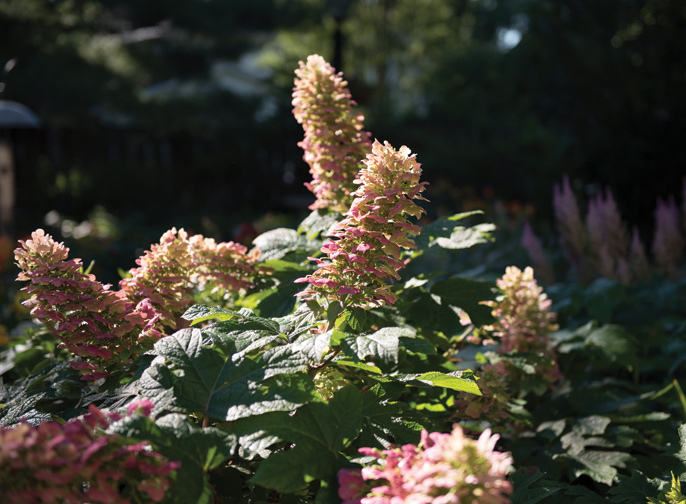 Another favorite, oakleaf hydrangea 'Ruby Slippers', provides a show of blossoms that initially flower white but turn ruby red as summer progresses. Other lesser known plant favorites include shooting star (Dodecatheon meadia) a shade-loving, May-blooming native wildflower with pastel blossoms that look as the name implies; bloodroot (Sanguinaria canadensis), another native, spreading, low-growing wildflower that features multi-petaled, white flowers with yellow centers atop rounded leaves; and Chinese ground orchid (Bletilla striata), which in spring produces small, Cattleya-orchid-shaped blossoms on 18-inch stems above sword shaped foliage. This plant also prefers partial shade. Those ground orchids are not the only ones to grace the Gravenses' garden when the weather warms. Carol's orchids all go outside where they hang from special hooks on a fence that runs along the side of the couple's home. In gardening season, Carol and Dan begin each day at 6 a.m. when they together water the garden and then enjoy morning coffee at a small outdoor table surrounded by the plants they love. The benefits of gardening, Carol and Dan agree, are physical in the exercise that is required to tend the plants, spiritual in that they are creating something beautiful, and social in that they are always delighted to invite even passersby on the street to come in and share what they have created. "People can come anytime and bring anyone they want," Carol emphasizes. One of the highest tributes to their garden that Carol can recall came from a friend who was having health problems and went out of his way to frequently pass by the garden because, "everything you do here makes me feel so good." 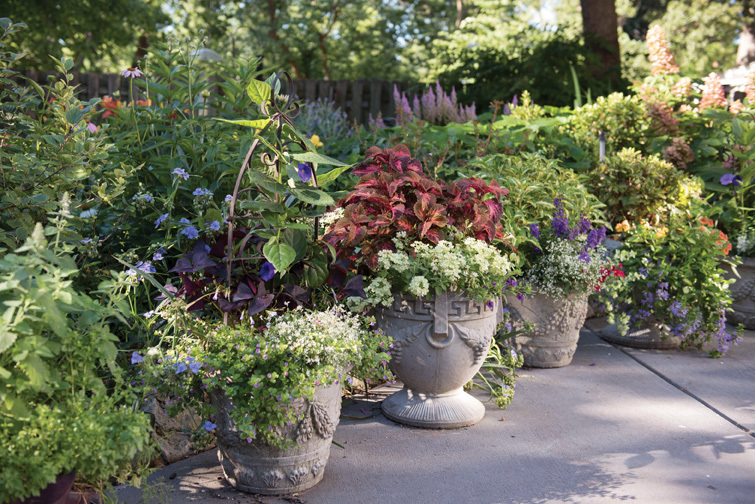 "What I love about gardening," Carol adds, "is that there is no politics involved. You can come together in all this beauty and nothing divides us."